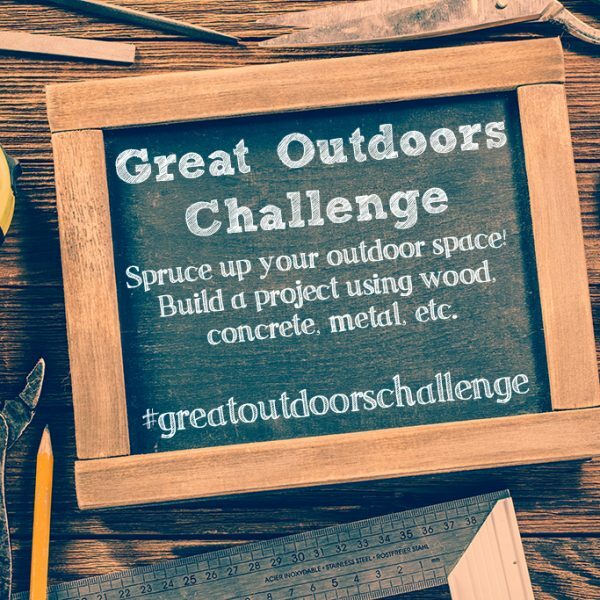 Fall is here and, in my neck of the woods (sunny AZ), it’s the time of year when the weather starts cooling down and it’s time for some outdoor entertaining. My husband and I love having friends over and entertaining. We’ve spent much of this year working on our landscaping and even added a 1,200 square foot patio extension to hold more of our friends when we have parties! 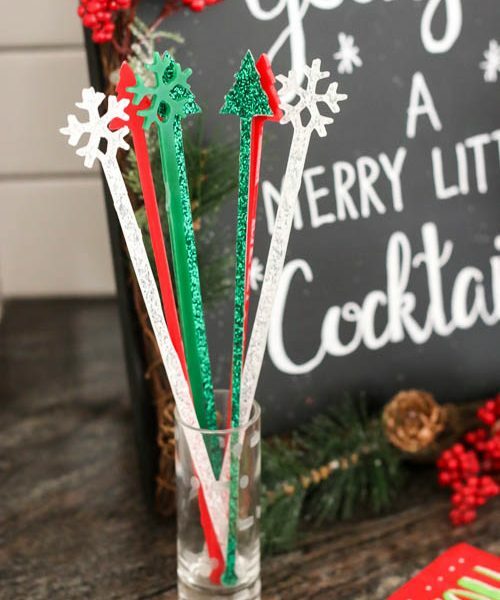 Having a place to store and mix drinks is a very great tool to have when entertaining. 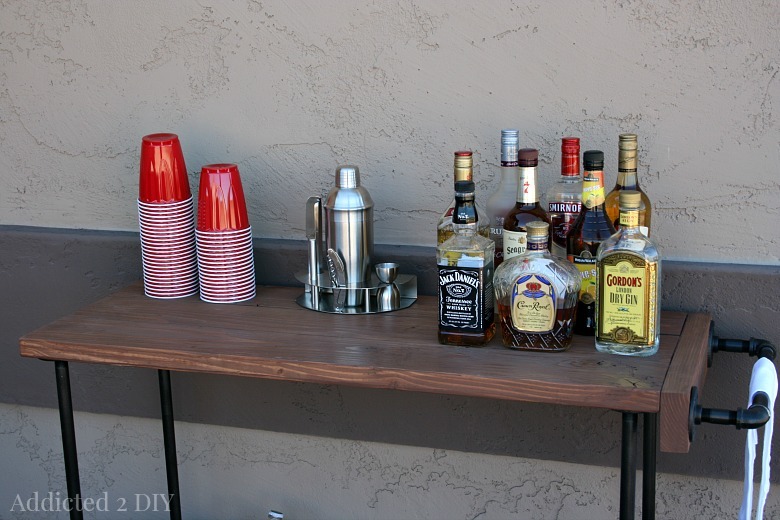 Which is why I thought it would be a great idea to build an outdoor bar cart. I have always been a fan of rustic decor and I am seriously loving the rustic industrial look. 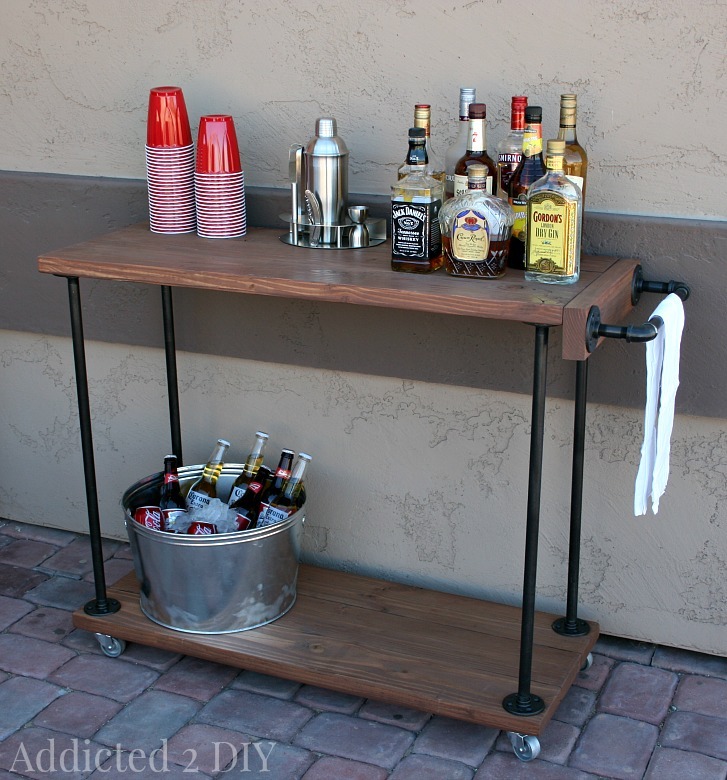 I’ve been itching to add some industrial elements to our home decor and this bar cart has been a great start! 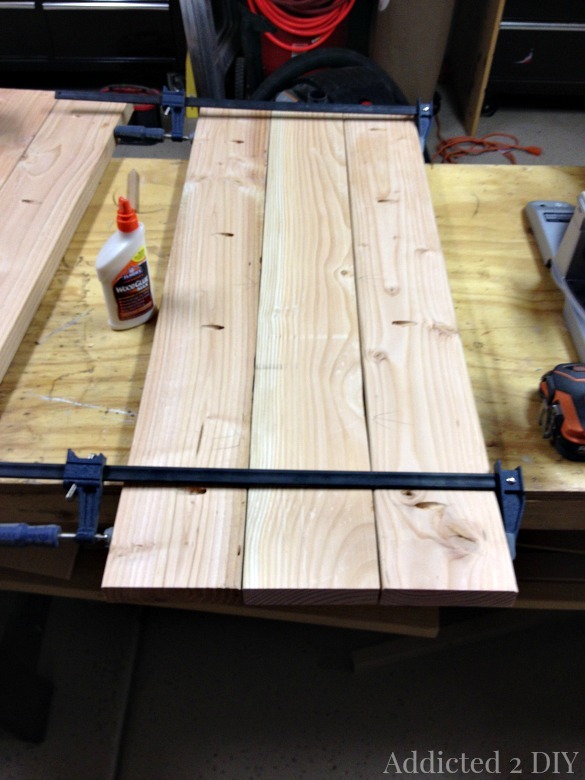 To get started, I grabbed some scrap 2×6 boards that we had leftover when my husband resurfaced our flatbed trailer. The boards have been sitting in our garage for months just begging to be used for a project. I knew they’d be perfect for this one! Four feet was a bit long, so I cut them down to 40″ long. I wanted the bar cart to have an upper and lower shelf, and three boards for each of the shelves was the perfect depth. I screwed pocket hole screws into the boards and then glued and attached the boards together using 2 1/2″ pocket hole screws. 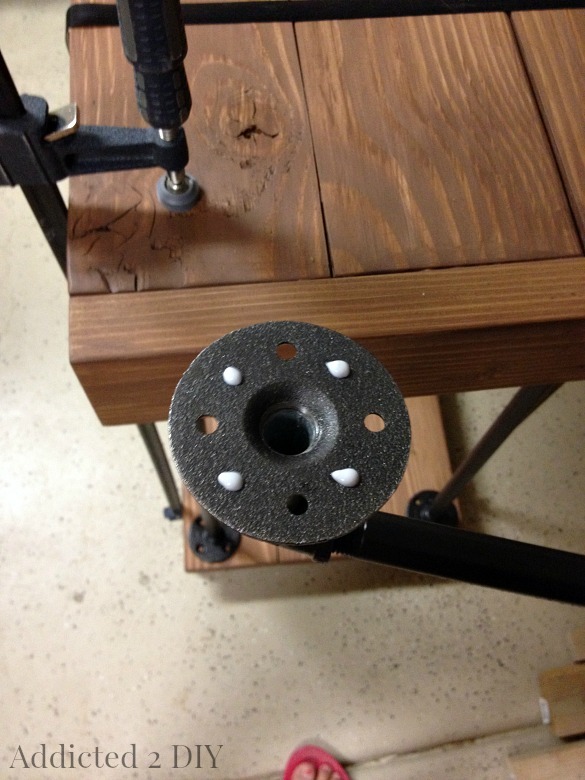 For the legs, I found the floor flanges on Life and Home for a super cheap price of $1.95 each. I needed 10 of the floor flanges for this project. I bought galvanized steel pipe for the legs from Lowes. I originally purchased 36″ lengths, but those ended up too long and it would have made the bar cart super tall. Not very conducive to my 5’4″ height. Thankfully, my dad had come to the rescue and loaned me his pipe cutter and pipe threader. It was a bit more work, but it was so worth it in the end. I also wanted to make a bar on the side for pushing as well as for towels. 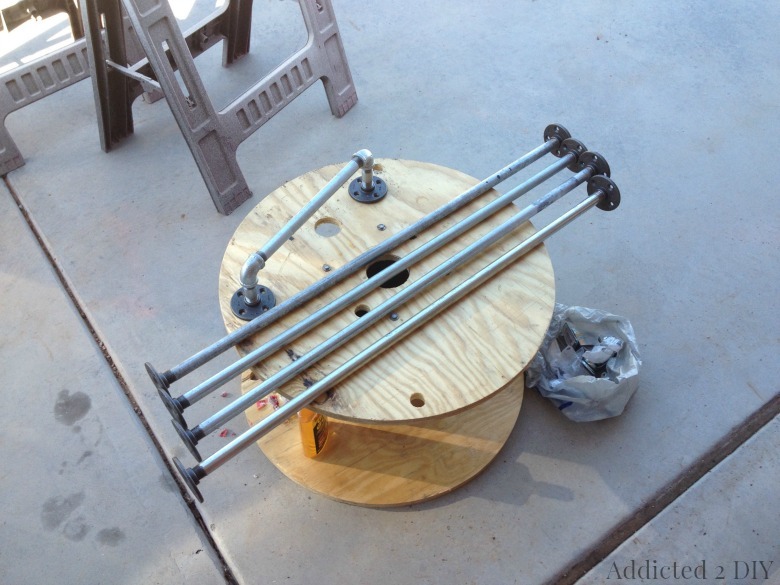 I purchased a 12″ piece of the galvanized steel tubing and a few 90 degree couplings. Once all of the pieces were put together. I hung them up outside and spray painted them with metallic oil rubbed bronze paint. 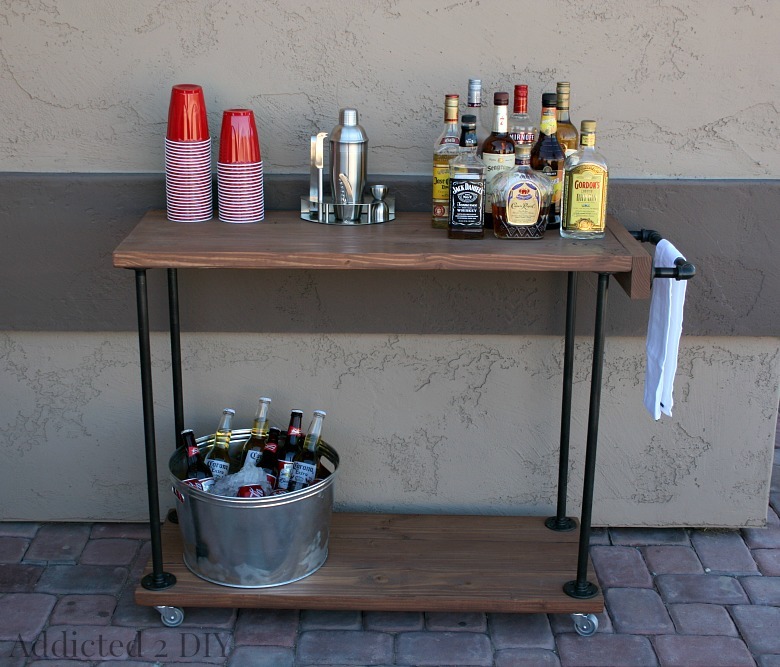 Since this bar cart is an outdoor cart, I stained it with an outdoor waterproof stain. I knew I needed a larger piece of wood to mount my towel bar, so I grabbed a scrap 2×4 and cut it town to size. 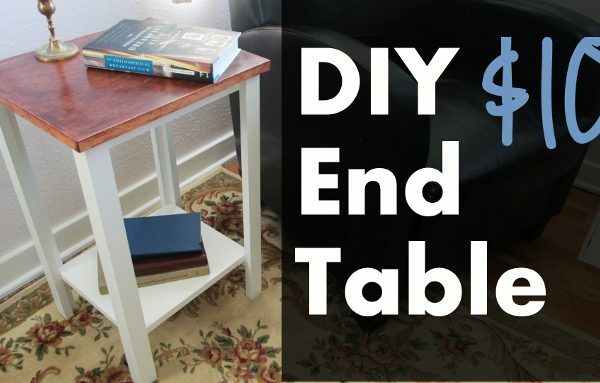 I then screwed it into the end of the top tabletop in order to mount my towel bar onto it. Once the stain was completely dry, it was time to attach the legs You may remember when I made these pegboard organizers with magnetic chalkboards a few months ago. In order to attach the sheet metal to the wood frame, I used Elmer’s ProBond Advanced. It was a new-to-me product and it worked perfectly! My boys draw on their chalkboards almost daily and they’re holding up great! Elmer’s ProBond Advanced is a great way to bond porous and nonporous materials together. No staples, screws, etc. are needed! I added it to the legs and then positioned and glued them all together. I then clamped the entire piece to allow the Elmer’s Probond to cure overnight. I did the same to attach the towel bar. The next day, I took all of the clamps off and made sure that everything was still holding the way I had left if the night before. The good news is that it was! The bar cart ended up being the perfect size to hold drinks of all types! 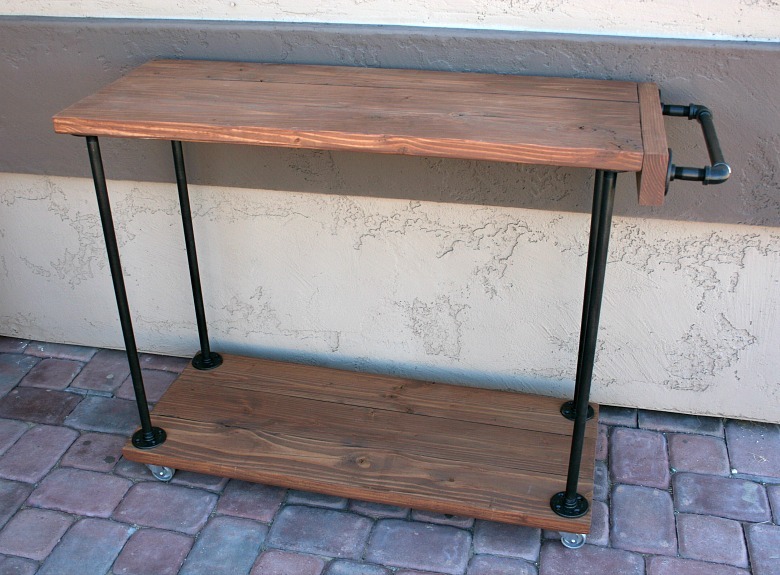 It’s a perfect piece for entertaining with the addition of the 2″ steel casters at the bottom. That way it can be moved around to and placed wherever everyone is sitting. I’m so happy with how it turned out and excited to finally have gotten to work on an industrial style furniture project for my home. I love how well the ProBond held up. It was strange not to screw things together, but ProBond really does form a tight bond between mixed materials. 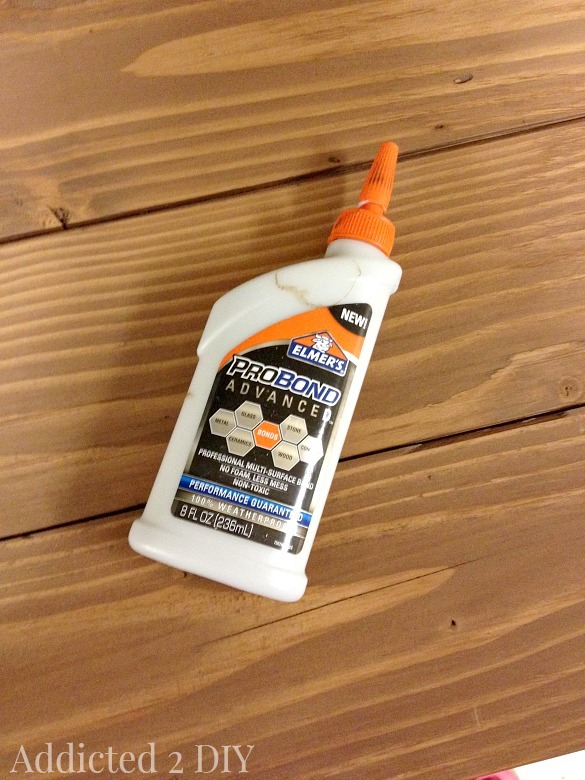 Have you ever tried Elmer’s ProBond? What would you or have you made with it? ProBond Advanced made it easy to bond mixed materials without the messy foam residue that would normally ruin my projects’ quality and finished appearnce. ProBond Advanced is the only multi-surface adhesive that bonds to a variety of mixed materials and gives me control of where the glue goes and where it stays while drying. ProBond Advanced saved me time and headaches with a translucent paintable finish, 100% weatherproof and performance guarantee, all while eliminating the hassle of foam residue. 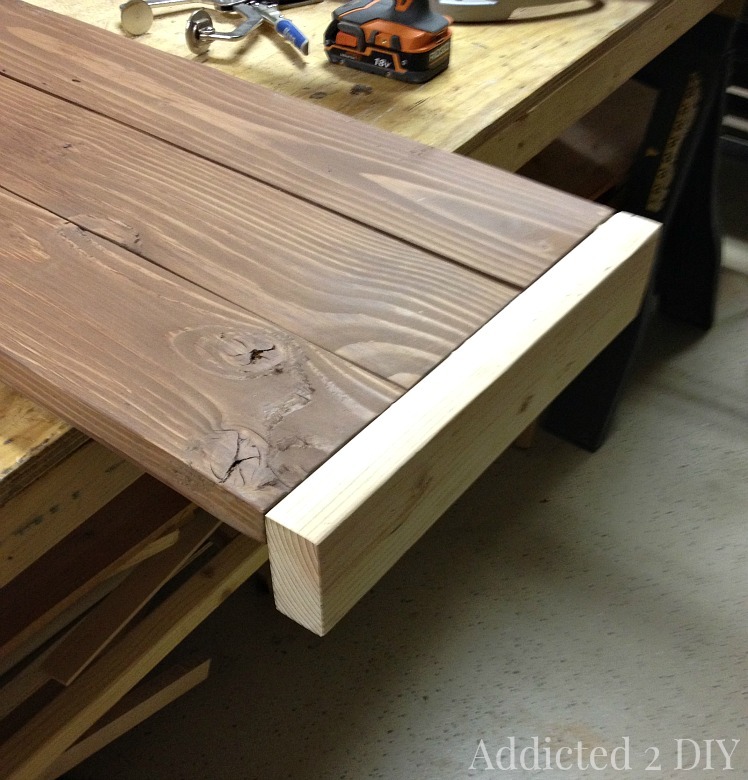 ProBond Advanced combined heavy-duty strength with ease of use that let me glue, clamp and relax. ProBond Advanced is the perfect multi-surface adhesive for bonding mixed materials, like wood or metal or ceramic to drywall, without any of the foam residue. For more information and inspiration, visit the Elmer’s ProBond Advanced and their Mixed Materials Pinterest page. This is classy industrial, I love it. Love this! It tuned out great! What kind of waterproof stain do you use? Thanks for the inspiring tutorial. 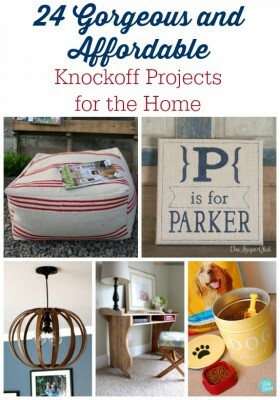 I’m feeling encouraged to break out the tools and hit up the hardware store this weekend.